Does Your Teaching Have a JESUS Gap? Heidi "Goosebumps" says: When was the last time a seminar gave YOU goosebumps? For me, it's been a l-o--n---g time. But then I heard Jen Bradbury talk at a youth conference about her book, The Jesus Gap. It made me want to shout "Uh-Oh!" and "Yes!" at the same time. after all our teaching and programming, do they actually believe Jesus is their Lord and their God? In a survey of youth across her Lutheran denomination, nearly half answered “no” to the question, “Is Jesus God?” They were also confused by how Jesus could be God’s Son, and also God in the flesh (divine). (Too) many surveyed thought they could be a Christian without believing in Jesus. Most thought of Jesus as a super-hero, a spiritual guru, or a Mr. Rogers, but not as their personal Lord and God. Neil, is this shocking to you? Neil the un-shocked: Sadly, no. Sounds like many kids I’ve worked with (and their parents). The Church has done a horrible job of explaining the Trinity. Our language is all over the place, and words matter when you’re teaching kids. And maybe I haven’t done a good enough job either. Maybe I taught too much "Church and Bible" and not enough "Jesus here and now." Heidi Goosebumps: You're not alone in that. Bradbury pointed out that the historic Church has long struggled with the teaching and belief in Jesus’ divinity. She even mentioned the 4th century Arian vs. Trinitarian controversy! And though we now say we’re Trinitarians, she makes the case that we continue to confuse our kids about who Jesus is, and are not preparing our kids to experience the LIVING CHRIST. …”We treat Jesus like a set of stories and doctrines, and not as a living presence in our classrooms, sanctuaries, and homes.” That's the Jesus Gap in our teaching. And like Jen, I suspect our declining numbers and declining belief are due, in part, to the gap we have helped create. Neil the less shocked: Ain’t that the truth. Over the years I’ve heard this called “teaching a stained-glass Jesus.” Our teaching emphasizes, “What would distant-Jesus-in-heaven want us to do.” We've turned faith in Jesus into a set of morals, while downplaying the transforming relationship with his Spirit that powers our morality. So what did she suggest? Heidi Goosebumps: Well, since you asked…. Talk less about God. Talk more about Jesus. Youth workers she polled said they talked about Jesus “all the time.” But that’s not what she heard when she observed them in action. They’d begin with Jesus and then switch to talking about God. “Jesus-talk would devolve into generic God-talk.” I know this sounds strange and a bit obvious to say, but God gave us a name to know, and it’s the name of Jesus. Talk as if Jesus is actually alive and with us – because he is. This one also made me wonder… is THE GAP created because too many of our teachers and leaders have THEIR OWN GAP? They do not have a “personal” everyday relationship with Jesus, or don’t know how to express it? Yeah, I think so. Talk without throwing around theological vocabulary and titles. Don’t assume that everyone knows their meaning. For example, explain that “Son” in “God’s Son” is not a biological relationship. Jesus the Son, is God showing us how to be his children through Jesus. Keep your eye on Jesus. Teach about both Jesus’ divinity and his humanity. I’m paraphrasing Jen here when she writes, “Bask in the wonder of the miracles that leave no doubt Jesus is God. But also explore the sleeping, eating, befriending, caring, and weeping Jesus --the human-like-us side of Jesus.” I think we have done a good job of emphasizing both sides in our Writing Team Lesson Sets at rotation.org. The thing is, we have to be more intentional. Neil the Adder: Those are goosebump points for sure. We definitely need to do a better job of modeling our personal relationship with Jesus to our kids and families. At church, we need to ditch the stilted language and pray in a personal way, share our faith stories, talk about when we’ve felt the presence of Christ and heard his voice, etc. 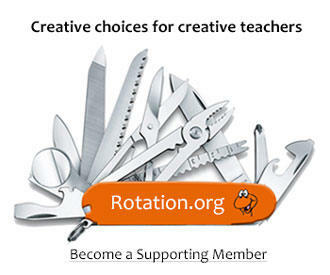 And at rotation.org, we need to keep in mind that we are helping teachers to evangelize kids, not simply tell stories. Heidi Goosebumps: Regarding the stories, she suggested we teach more Jesus stories and not over-do the Old Testament. I agree with her on that. Too many curriculums give Jesus the short end of the calendar stick after they cover Advent and Easter. She emphasized that when we DO teach from the Old Testament, that we help our kids see how Jesus fulfilled the OT's promise of a liberating, kingdom bringing, creation-caring, saving Messiah, ...who still lives. I should also mention Bradbury’s terrific blog: http://jesusgap.com/ and the “gap like” article you wrote for Rotation.org some time ago, “How to write and teach lessons that don’t just inform, they transform.” They are full of teaching suggestions. Neil: Thanks for the plug! Heidi, do you think part of THE GAP PROBLEM is because some people were raised to “relate and pray to God the Father” and not directly to Jesus? I know that describes how I was raised. “God the Father” is a little more distant -- a “safe” distance, and the Holy Spirit was this amorphous Jesus-less thing, ...not Jesus himself. It’s almost like Jesus was done and gone. Heidi: I think that’s true for many of us raised in mainline denominations. We are like the disciples on the Emmaus road – yes, our hearts burn, but we do not fully acknowledge who’s walking beside us. …And our children inherit our condition. Heidi: Great song! And open those of our children too. I would encourage people to have this conversation about “The Jesus Gap” with their teachers and pastor; at the very least, with yourself. Jesus lives, you know? Neil: Thanks for sharing your goosebumps! Let’s keep the conversation going. Heidi Weber served on the Rotation.org Board and has been the Christian Educator at 1st UMC in Slidell Louisiana. Neil MacQueen is a Presbyterian minister specializing in Christian Education and is one of Rotation.org’s provocateurs. They welcome your reply and insights. Show this post's exact URL in your browser's address field. And which "type" of Jesus should fill the gap? Which image of Jesus were you raised with? Speaking as a lifelong and seminary-indoctrinated Presbyterian, I think my tradition has been afraid of talking "too much" about this Jesus, and a bit too quick to disparage those traditions that talk like Jesus is their "BFF." It's like we're embarrassed by Advent, the Gospels, and yes, The Trinity. Jesus wasn't just a warm-fuzzy between the OT and Judgement Day. Like these say on Easter, "He is Alive." Thanks for such a great post and discussion. I've added this book to my list of "retirement reading." I agree that it's hard to teach concepts that we personally struggle with. And the Trinity is a biggie for sure. I heard a sermon recently that referred to Jesus (the Word) as God's conversation with us. I loved that! Looking forward to reading this book! This blog was an eye opener for me and I see exactly why you got "goosebumps" Heidi! I've always struggled over the Trinity myself and I've never read or found through study anything that made me feel I understood it. So in all honesty, I either avoided teaching it if I could, or when I did I always felt afterward that my own confusion couldn't help but have leaked through. I'm really looking forward to reading the book, The Jesus Gap. “Son” in “God’s Son” is not a biological relationship. Jesus the Son, is God showing us how to be his children through Jesus. God gave us a name to know, and it’s the name of Jesus. Help the kids look/find that “personal” everyday relationship with Jesus. Do more NT stories - explore the sleeping, eating, befriending, caring, and weeping Jesus --the human-like-us side of Jesus. When teaching OT stories help the kids see how Jesus fulfilled the OT's promise of a liberating, kingdom bringing, creation-caring, saving Messiah, ...who still lives. Keep reminding them - Jesus is here and now! Thanks for sharing the book and your insights on the Jesus Gap! "Paste in My Hair" is a collection of teacher training resources written by and for Sunday School teachers. Our posts offer fresh insights and suggestions you can immediately use and share. Reading the blog requires either a free Registered Membership or Supporting Membership. Become a registered or supporting member today! General Inquiries, Tech Support, How-to, Email News Subscription Help, and Suggestions can be posted by all visitors and members here in our support forum.